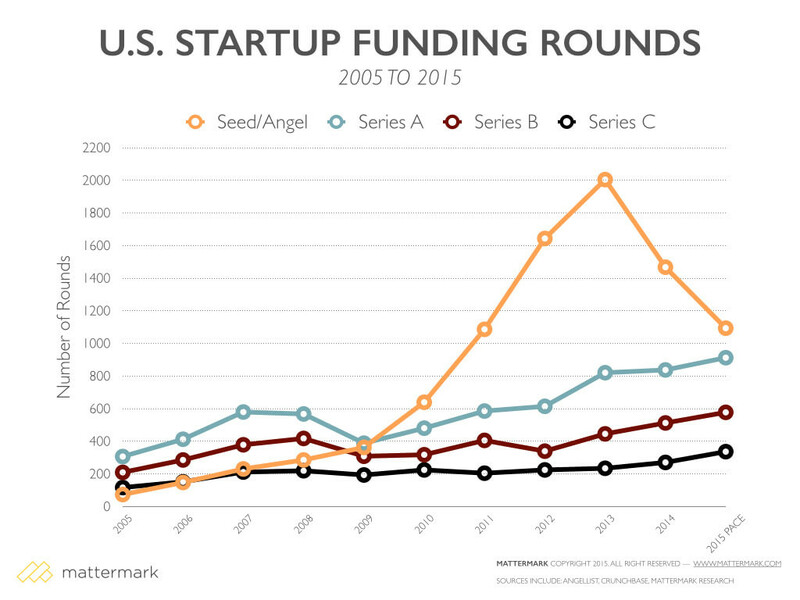 Pretty hard to miss the huge blip in Seed/Angel deals in 2013 (but really from 2011 and continuing through 2015, with a peak at 2013). Most of you already knew this intuitively, but seeing it in black and white (at least for me) was eye opening. And while there are more Series A deals being done every year, they’re not even coming close to keeping up with the pace of Seed deals. From an ecosystem perspective this is both what you’d expect and ultimately a good thing. We’ve certainly seen markets where too many companies passed through each funding stage and ultimately that had terrible consequences for the market, for investors and for founders. The best markets are those that are acting rationally and efficiently. We may even be running a bit hot from that perspective (subject of a different, upcoming post, by the way). From the perspective of a Seed funded founder, this should be a clear warning sign that it’s not going to be easy to raise your Series A. 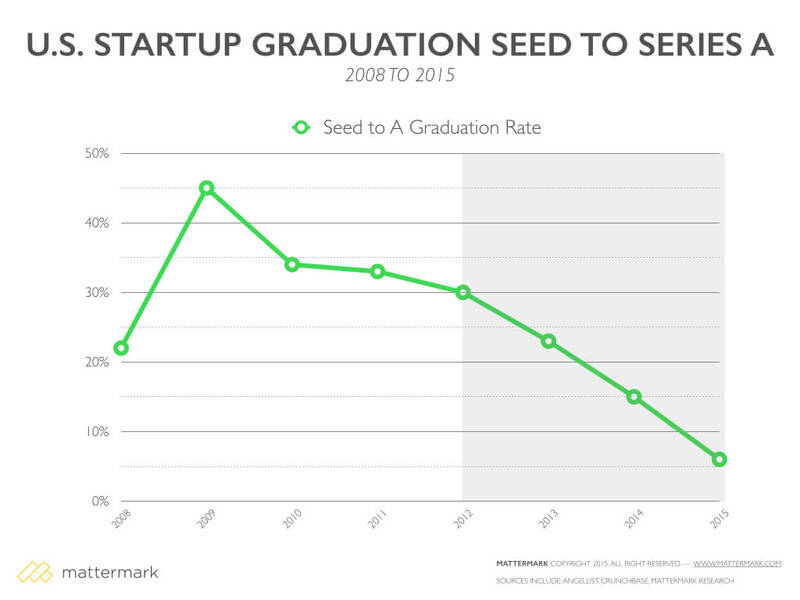 In fact, if you look at the trend line of Seed companies “graduating” to Series A, you can see in stark relief the challenge ahead of you’re a Seed funded founder. We’re clearly seeing this here at Foundry. Our deal flow is always pretty robust, it feels off the charts right now. The number of things that we’re turning down that are interesting, have solid traction and that will ultimately get funded (or should be funded) is unprecedented. I think that’s a direct reflection of the trend described in the charts below. Lots of companies raised Seed rounds, many performed solidly in their seed period and there are a large number of Series A opportunities in the market right now. There’s no easy advice here if you’re a founder looking to raise your Series A. Obviously, start with building a great business and stand out because of your metrics. But that won’t be true of every business – many good ideas take time to develop market traction. So it’s important to recognize that in the current environment there’s a ton of competition and you’ll need to design your financing process with that in mind (be deliberate in who you target, make sure you’re showing exactly where you’re outpacing the rest of the market, build a larger list of prospective investors, etc. ).